Could storm Doris blow UKIP to victory in Stoke Central by-election… and topple Labour? 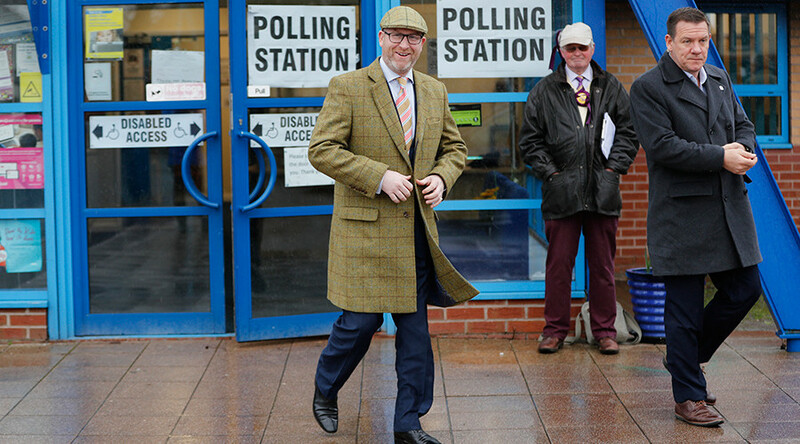 It’s being predicted that Storm Doris could help UKIP leader Paul Nuttall win a crucial victory in the Stoke Central by-election. A UKIP spokesman has suggested the tempest which is currently battering England with winds of up to 94 mph (151 km/h) will deter Labour’s more “apathetic” voters from heading to the polls. Brexit supporters on the other hand will be more determined and so will register their support for UKIP, the spokesman said. So far Friday’s gales have left more than 2,000 homes without power across northern England while transport has been disrupted across the country. But even Storm Doris will seem small compared to the political storm that would follow a UKIP victory in Stoke, which would likely trigger a major upheaval within the Labour Party. Stoke Central is considered a Labour safe seat, having consistently voted for the party since the 1950s. A UKIP spokesman told the Daily Express: “It is very finely balanced in Stoke. Storm Doris could make all the difference as our voters are more committed while many of Labour’s are likely to be apathetic. The Stoke Central by-election was triggered by the resignation of former Labour MP Tristram Hunt, a staunch Remainer, who left politics to head up the prestigious Victoria & Albert Museum in London. Despite the Labour Party’s commitment to Brexit, polls show Stoke residents – who voted overwhelmingly in favor of leaving the EU last June – are torn between the two parties. A Google poll of 1,000 voters carried out by local newspaper The Sentinel found 26 percent said they would vote for Labour, while 25.8 percent said they would back UKIP.